Put the "modeler" back into RC Modeling! Adding another level of scale detail potential to your RC model aircraft, Motion RC now offers 3D Printed Upgrade Part ("3DPUP") Sets for select models from Freewing and FlightLine. Due for a Late April arrival, we implore pilots who are interested to get their pre-orders in before April 9th. These are new for Motion RC and Freewing so we want to make sure we have the right amount produced to make it worthwhile. 2) Gator-proof - Cockpit sets bring the additional advantage of curbing the unsightly "gatoring" that is common to black foam aircraft, which guarantees a perfect fit between the original foam aircraft and the 3D printed parts. hat occurs when dark foam bubbles under heat and UV radiation. 3) High Def Detail - Instrument panels with details as sharp as 0.10mm, accurate ejection seats, and other assemblies feature details impossible to render in molded foam. High resolution, high accuracy. 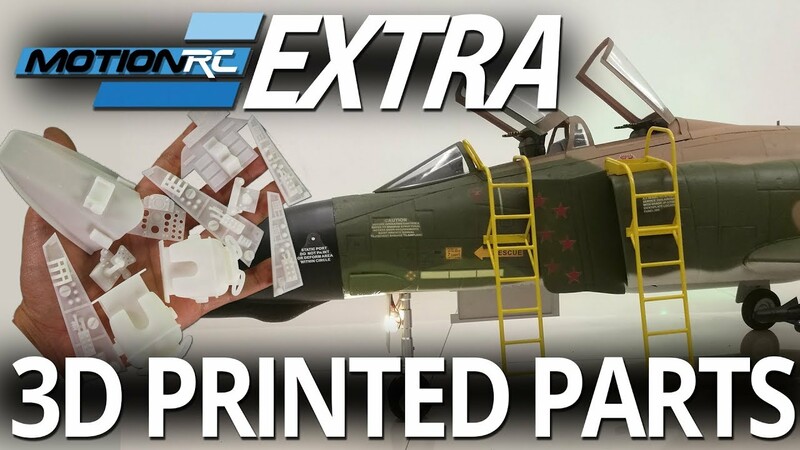 1) Pre-Printed - Available for purchase on our website under the aircraft's "Upgrades" tab, each 3DPUP Set arrives to your door pre-printed, cleaned, trimmed, and ready for your paintjob. Modelers can further detail the parts to their desired level, then install the parts with standard foam glue. Basic modeling skills and materials are required. For modelers with access to a 3D Printer or who want to use a third party 3D printing service, we are also offering for a limited time the original .STL files for free download on our website, under the aircraft's "Support" tab. Modelers are responsible for preparing the file for their own printer's specifications. These downloadable files are ideal for modelers who enjoy tinkering with printer settings and materials. Please note, we only provide the .STL files themselves; we cannot provide tech support for your specific printer. By downloading the .STL files, you agree to not monetize the file in any way without Motion RC's express written consent. * What do YOU think of 3D printing? * Would you like to see more 3DPUP sets released by Motion RC for Freewing, Flightline, and other aircraft? * What aircraft should we create 3DPUPs for next? Let us know here. Share your thoughts, be heard, and weigh in. If we don't hear from you, we may cancel the idea, but if there's a show of support, 3DPUPs could eventually be made available for almost all our premier aircraft brands. I've watched the video, AWESOME!!!!!!!!!!! I just preordered! Thanks Motion! I think it's a great idea. I really like the fact that you release the 3d files. Way to go. The pilots and the cockpits are obvious requests for just about all planes. The 1960's birds should not have 1990's pilots. Why did they go to that ridiculous pull over visor anyway?. And don't get me started on the mittens. Also vortex generators for the A-4 would be nice. And some 3d files for external tanks, ordnance, antennas, (hint scale helicopter antennas and WSPS, etc) are sorely needed. Downloaded and ready to print!!! I think this is just a fantastic idea. Love being able to take a plane to the next level that this technology provides for. Way to raise the bar Motion and thank you for providing the files. I just got myself a 3D printer so I am starting to learn how to use it and am printing the first part I designed in Fusion 360. I look forward to printing these and many more parts for future releases. Pilots would be great additions, maybe gear doors for future releases that don't come with them. MER's, TER's, aircraft specific ordnance, the sky is the limit. I will certainly be purchasing all of these neat goodies for the F-4! How about a 3D printed RF-4 nose cone? If parts were available to convert the presently available A-4E/F into an A-4M, I'd have to buy those parts, and another A-4 to put them on. yes please! but for other planes, especially the A-10! Nice to see the non-scale F-4E type nozzles replaced. However, the printed parts are still not as scale as the rest of this magnificent model in that the Collar "sticks out" WAY TOO MUCH. Also, I assume the reason that the nozzle is closed so much is for model efficiency. Picture is from Tommy Thomason site. Could there be 'Splitters and Intakes' coming as well...hmmm...maybe...pretty please. I'll sweep up around the Motion RC office for free for a month. 2. It is good business to separate this from the airframe. Some people want the details, some people don’t, and it would substantially increase cost for everybody to provide molded plastic parts with the airframe. b. Beg a set off somebody who has a printer. c. Buy the printed parts. I see a lot of (a) and (b) going on. Not sure how many people resort to (c). I would highly recommend buying a 3D printer to anyone considering it. You don’t have to buy many parts before you come out ahead just buying a printer. And it is super cool to be able to download and print anything. I use it for much more than just these files from MotionRC. There are many sources of useful pieces, and the fact that you can scale arbitrarily is a huge advantage. How many hours have you spent on the internet searching for some scale detail at just the right size? Also, you can paint and customize however you want, or print just a subset, etc. It gives you a wide range of options of how much time you spend messing around with your foamie. Anyway, thanks to MotionRC for this innovation. Once you have a printer, this method adds a lot to your model, at only a few cents cost. I've got a friend with a 3D printer and I will see if he can do these for me. Looks great. Adds that something extra not too many people will have. What printer are you using that has 20um resolution? My printer claims 20um minimum layer height, but if I choose the "high detail" preset it defaults to 50um. If I manually change only the layer height to 20um, it prints much worse....looks like it is melting what it already printed, and just making a mess. Maybe I have to change many other things to avoid this. I tried messing with some of the other parameters (fan, etc. ) but I never found anything that prints better than the "high detail" default settings with 50um layer height.